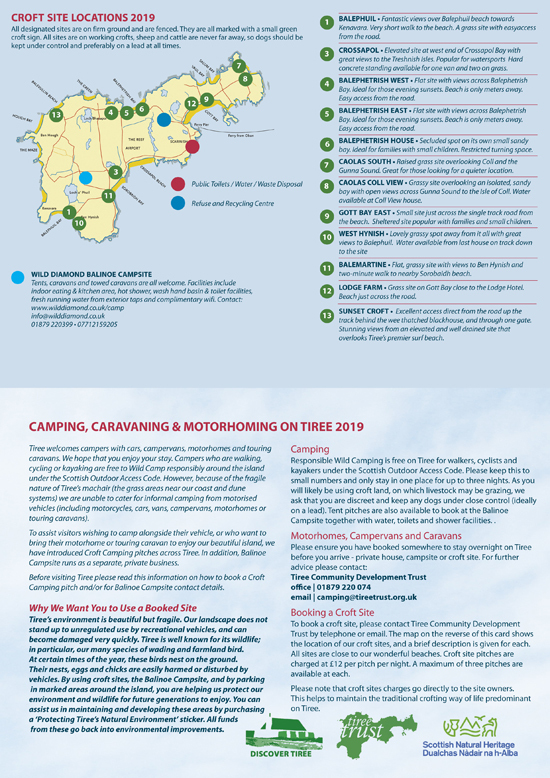 If you plan to camp and are arriving with a vehicle, please reserve an overnight pitch before your visit to Tiree. Overnight pitches are located either at the privately managed Wild Diamond Campsite in Balinoe, or on one of our Croft Camping sites. THE RANGER IN ADVANCE OF YOUR ARRIVAL ON TIREE. The availability of space on our croft pitches is rarely a problem. However, popular locations do fill up as the season progresses. In most cases we should be able to accommodate one of your top three preferences. If you would like to use a croft site, you must contact the ranger in advance of your arrival on Tiree. Our ranger fulfils a variety of duties around the island - in addition to receiving numerous enquiries about croft sites, outdoor access and wildlife. We advise that you allow a couple of days for your request to be processed before you plan to book your ferry crossing. Croft sites are charged at £12 per night. You can stay at more than one site during your visit. Please note that our Croft Sites DO NOT offer amenities. See the additional information regarding drinking water, toilets and chemical waste disposal on Tiree. Please see the PFD map below for locations and details of our Croft Camping sites. Your booking will be confirmed by email. You are welcome to use more than one site during your visit. There are a maximum of three pitches available at each location. Space on our croft pitches is rarely a problem. However, popular sites do fill up as the season progresses. In most cases we should be able to accommodate one of your top three preferences. Please note that there isn’t a cash machine on the island. If you wish to make your payment in advance, the booking form includes details of how to do this. Vehicle camping away from approved pitches is not permitted on Tiree, in accordance with the Scottish Outdoor Access Code. Scotland’s national outdoor access rights do not extend to motorised vehicles, and we ask that our guests respect this. Please Note: Previously, we requested that guests met the ranger at the ferry terminal. However, parking has become difficult – especially for larger vehicles, and when there is a line of disembarking traffic behind. We now ask that you visit the Tiree Community Development Trust office. Once your ferry has docked, please proceed to the Tiree Community Development Trust in Crossapol. This will allow you to ask questions about your visit, collect maps and information leaflets, collect your Permit, and make any outstanding payments. For those arriving on an evening boat, please go directly to your croft site and visit the Trust the following morning (this must be before 12:30 at weekends). After disembarking, follow the road to the first junction. Turn left at this junction, through the township of Scarinish. Continue on this road without turning for approximately 4-miles. Once you pass through the first chicane, take an immediate left into the Tiree Trust carpark. Go through the left-hand door, and on through the double doors into our office. We have a very fragile but beautiful environment on Tiree (Machair grass). This does not stand up to continued use by motor vehicles and can become damaged very quickly. Tiree is also well known for its wildlife, in particular the many species of birds that are found here. At certain times of the year we have many ground nesting birds, which can easily be disturbed by vehicles. By using a croft site, or the campsite at Balinoe and marked parking areas around the island, you are helping us protect our environment and wildlife for future generations to enjoy. All designated sites are on firm ground and are fenced. They are all marked with a small green croft site logo. As all sites are on working crofts, sheep and cattle are never far away, so dogs should be kept under control and preferably on a lead at all times. LOCATIONS CAN BE FOUND AT THE BOTTOM OF THE PAGE. Wild camping is free on Tiree for backpackers/walkers, cyclists, kayakers, etc. Please keep this to small numbers and only stay in one place for up to three nights. Please be discreet as you will be generally using crofters land on which livestock may be grazing. Tent pitches are also available to book at the Balinoe Campsite together with water, toilets and shower facilities. Fresh water can be obtained from a tap outside the public toilets at Scarinish. There is also a waste disposal point for chemical toilets to the right of the toilet block in a fenced area. If you use this please flush the chute afterwards to keep it clean and clear for the next user. If you do not have toilet facilities, please do not bury your waste as it pollutes the soil and in turn the island’s drinking water, whilst also starting erosion. Tiree’s refuse and recycling site at Gott is open Monday to Saturday at various times for public use. Days and times are detailed below. Please do not put your rubbish in bins situated at the roadside, unless otherwise indicated as these are for private household use only. There are public bins at the pier head car park and also by the public toilets in Scarinish. Parking areas have been established at many beaches and locations around the island for vehicles to park. These have been provided to limit damage to the sensitive machair. Please use these to help us preserve our environment and stay within the marked areas and take all rubbish with you when you leave. Tracks across machair are not a given right of way, they are there to facilitate land management, access to houses, or for emergency vehicles and are not for general public use. A disabled person may use a suitably adapted vehicle on these tracks to access countryside and beaches. An annual sticker “Protecting Tiree’s Natural Environment” can be bought for £5. All funds raised from these are spent on improving access, tracks and parking areas. This is available from the tap outside the public toilets in Scarinish. Available at the Calmac Office at the pier head and near the Co-op in Scarinish.